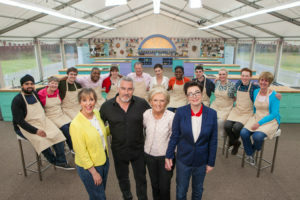 Follow 12 amateur bakers in their quest to be named Britain’s best as the popular competition series The Great British Baking Show returns for its fourth season. New episodes will air on CPTV Saturdays at 5 p.m. beginning June 24, 2017. The show tests the competitors’ skills on cakes, breads, pastries, and desserts, crowning a winner after 10 weeks of competition. On CPTV: Saturday, June 24 at 5 p.m.
Meet the 12 bakers as they tackle a back-to-basics British classic, a popular cake with a fatless sponge and tricky chocolate work. The showstopper is sophisticated and high-end. With this cake, there’s nowhere to hide. On CPTV: Saturday, July 1 at 5 p.m.
On CPTV: Saturday, July 8 at 5 p.m.
On CPTV: Saturday, July 15 at 5 p.m.
On CPTV: Saturday, July 22 at 5 p.m.
On CPTV: Saturday, July 29 at 5 p.m.
On CPTV: Saturday, August 26 at 5 p.m.
On CPTV: Saturday, September 2 at 5 p.m.
On CPTV: Saturday, September 9 at 5 p.m.
On CPTV: Saturday, September 16 at 5 p.m.
Passport Holders: Watch It Early! CPTV Passport holders will be able to stream all 10 episodes of the season before they premiere on CPTV. For more information, click here.